Central Kreuzberg is known as the biggest Turkish city outside Turkey and is famous for its cultural diversity. When Berlin was divided, the district became a melting pot of foreigners and the centre of an alternative artistic scene. After the wall came down, the district suddenly found itself in Berlin's geographical centre, and rapidly developed and became more upmarket. But hip and history live side-by-side in Kreuzberg with its numerous museums, traces of the Berlin wall and the legendary Checkpoint Charlie. The district is now home to some spectacular contemporary architecture, such as the Jewish Museum designed by Daniel Libeskind. There are numerous ethnic restaurants and alternative bars in Bergmannstrae. The S6 overground train and the U1 and U7 underground lines cross the district east-west while the U8 and U6 cross north-south. The latter also stops near Tempelhof airport. 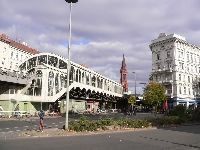 The S1, S2 and S25 trains run along western Kreuzberg.